A public administration driven by social justice… while embodied in the Constitution, to what extent does it materialize in modernity? Is it appropriate for American public administration to financially secure equal blessings of liberty? Obviously, the first question warrants nuanced answers beyond this article’s purview, but perhaps the second’s redaction down to the single issue of pay equity might demonstrate a need for public administrations toward spirited attempts rather than prophetic self-efficacies, appearing dedications or utter disregards of social justice issues. To answer these questions, three discussions ensue. First, justice’s foundation within American society must establish administrative applicability. 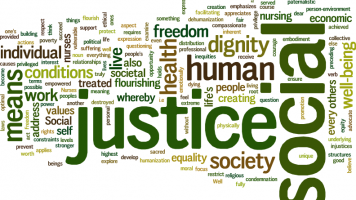 Second, defining social justice must incorporate some bounds to ensure adequate issue selection. Finally, the structural consideration of public administration must determine the extent of its sentient character apart from other machinations, such as politics, particular industries, etc. Emanating from British traditions, Thomas Jefferson initially contended that Americans were owed inalienable rights of life, liberty and property, not happiness. American courts have similarly opinioned that liberty refers to far more than freedom from unlawful prison, but of just opportunities to engage in activities to heighten the capacity of minds and of material wealth. As such, this property-justice connection serves to secure liberty. More recently, John Rawls’ distributive justice asserts that people possess “an inviolability founded on justice that even the welfare of society as a whole cannot override… justice denies that the loss of freedom for some is made right by a greater good shared by others.” Here, the classic iteration of property justice meets the modern conundrum of economic capacity and fairness for liberty. Hence, public administration, tasked with executing powers distributed to agencies through constitutional channels, should address the lingering issue of pay equity if it is to uphold its ordained security of liberty. The second concern, that of identifying the nature of pay inequities needing public and administrative interventions, remains both an issue sufficiency and venue problem. Immense evidence, both from government sources and movements’ anecdotes, supports that pay equity remains unjust, though attempts have been made. One example, the 2009 Lilly Ledbetter Fair Pay Restoration Act, allows for increased time to sue for equal pay, given that many employers restrict discussions of wage and benefits between employees. However, the widely cited 82 percent female-to-male pay ratio actually only applies to one demographic set, Caucasian female to Caucasian male employees. Upon closer inspection, the gap across female employees’ ethnicities ranges from approximately $.58 to $.87 for every $1.00 per Caucasian male employee. Combining these socioeconomic inequities with continuing cultural barriers in certain professions, temporal inconsistencies in employee ages and pay inequities, and others, issue sufficiency is met. Finally, having established a necessity and a societal responsibility for correcting pay inequalities, why should public administration be the venue to bring about change? Could not the market or politics better sharpen societal responses to social justice concerns than bureaucratic red tape? One could claim the social reform movements actually harkened administrative sciences and crafts back to the American state in the late nineteenth century, thereby providing the historical argument. Logic reveals this pay equity problem is beyond contractual or even property-driven, so mere reliance upon court doctrines and decisions would be inadequate from a legitimacy perspective in administration. In fact, courts’ modern constraints of pay inequities are housed within three comparable worth principles. First, jobs fall within a spectrum of value to a company; second, these jobs constitute an ordinal ranking independent of job title and physical labor demands; and finally, salaries and wages must roughly match up to positions within the same ranking of company worth. These principles woefully disregard the broader needs of employees by only articulating firm boundaries, actually prompting social justice movements. However, a better argument for venue selection exists. Public administration must serve as the forum for the social justice issue of pay inequity because of its dualistic representative capacity. First, public administration implies an external representation of the United States manifested to serve. As such, the passive, active and symbolic forms of public administration representation engage social justice needs by demonstrating societal possibilities. Thus, social justice concerns are highlighted, not hidden by red tape because public administrations function on civil servants, not merely human capital components. In short, public administration externally humanizes social justice problems rather than belittling and isolating them. Second, and perhaps even more vital, public administration’s efficacy to citizens rests upon engaging others. This internal aspect suggests that the institution requires listening to social problems, particularly those of injustice due to street-level concerns of policy implementation. The problem, of course, is determining the volumes of certain issues, but nonetheless the issue should be brought to the proverbial table. The institutional and structural question of social justice-driven public administration, imprinted on the minds of scholars, leaders, citizens, among others, challenges the U.S. government’s legitimacy. Its constitutional authority remains to secure the “blessings” of liberty, argued here to be social justice. While imperfect, U.S. public administrations bear responsibility for addressing the issue of pay inequities as people remain denied equal blessings of liberty, and therefore pursuits of happiness. Author: Nicholas Mastron is a current PhD student in Public Policy & Administration at the George Washington University, with a field specialization in Gender & Social Policy. His email address is [email protected] Follow him @NicholasMastron.